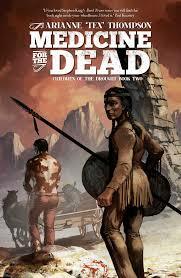 I have been on a "weird western" reading kick as of late. I can't seem to get enough of them and love reading all the different takes authors have when they are pulling from the same core foundation. 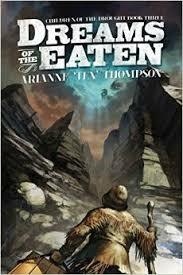 Arianne 'Tex' Thompson's Children of the Drought trilogy was recommended to me a few times via the Twitterverse and with the recent release of the final installment, I decided to jump right in for a binge read of all three. The first book, One Night in Sixes, definitely wastes no time in setting up the main characters, Sil Halfwick and Appaloosa Elim, for a hard journey into Eaden territory, place neither have ever ventured. 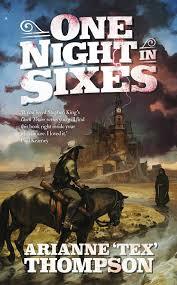 One Night in Sixes takes place over the course of an eventful few days where Elim, while trying to chase down Sil, manages to get himself into a heap of trouble after inadvertently killing a man. Their roles end up in reverse as Elim heads deeper into Eaden territory as part of his atonement and Sil finds himself trying to help Elim. I found myself in love with Elim's character as well as the secondary character, Dia, who comes to play a larger role in the next two books. The strength in the trilogy as a whole comes more from Thompson's character building than world building. More than once I found myself a bit confused about the world itself and how things came to be the way they were but I tried to let go of that and focus on the characters and their relationships. Medicine for the Dead is the second book in the trilogy and finds Elim still on his journey through a'Krah territory towards the capital city, Atali'Krah. Accompanying the corpse of the man he killed and two a'Krah men tasked with getting them all there safely, Elim soon learns he will face new hardships and learn more about his true history than he ever thought possible. Some of the world does become more clear in the second book but I came to think of it as background and was more interested in focusing on the characters and what could possibly happen to them next. There are demigods and multiple holy figures at work Elim is often faced with more than a language barrier; he is forced to confront his farm upbringing where he was purchased and raised as a stand-in son for a family far-removed from the native lands were he was birthed and stolen. This second book deepens the character relationships, my favorite part of the entire trilogy. We are also given a broader look and understanding of the freshwater mereaux race of amphibious people and their relations with people living on both sides of the river. In the final installment, Dreams of the Eaten, we find our various parties attempting to make their final push towards Atali'Krah. (I am leaving this vague specifically to avoid spoilers). There are trials to be faced at every turn and Elim finds himself nearly spent, of hope, energy, and the will to keep trying. Elim and Dia, Vuchak and Weisei, Shea and Fours, all these individuals find themselves facing down their own history as they attempt to reconcile all the choices they've made and the people that shared in the consequences. Throughout the entire trilogy I felt the hope from each character that they could do better and be more. The heart of each book is found in the characters. However, the world itself could sometimes be a confusing mash-up of the actual history and language and soft shifting towards fantastical elements. Nerd Coefficient: 7/10 "Wonderful characters you'll want to spend more time with." POSTED BY: Shana DuBois--extreme bibliophile and seeker of raindrops.